The central bank of the United States, the Federal Reserve, has put out “educational material” on Bitcoin for teachers and students (including a quiz!). The Bitcoin parts are odd enough, but this and a subsequent blog post will focus on the following statement: “traditionally, currency is produced by a nation's government.“ Is that a fair representation of monetary traditions? At the very least it is quite incomplete. This two-part series will proceed back in time, showing some of the many examples non-governmental money, in order to fill in some of the gaps. Privately issued IOUs and privately minted coins are covered here in part (i) of the series. These IOUs can more specifically be described as bearer promissory notes, and even more specifically, when issued by banks, bank notes. The Bitcoin public blockchain implements a global settlement layer ("layer 1" in bitcoin parlance). The closest historical analog to the Bitcoin settlement layer is not to the bank notes, nor even to the coins (despite its name), it is to the monetary metal that for most of monetary history from ancient civilization to the 20th century ultimately underlay the IOUs. This "metal layer" of historical money systems will be covered in part (ii) of this series, as will some even more ancient forms of non-governmental money. Higher layers of the bitcoin ecosystem, which can include exchanges (centralized or decentralized) as well as more trust-minimized systems such as Lightning, correspond most closely in our rough historical analogies to checking accounts (which, although often counted by economists as part of the money supply, and not created or managed by governments, will be so familiar to most readers that they will not be covered in this series) and to private bank notes. In these higher layer monetary systems, a more computationally (or for bank notes physically) efficient medium is substituted for a less efficient medium (for bank notes, often the underlying metal), usually (as is the case with checking accounts, bank notes, and centralized bitcoin exchanges alike) at the cost of increasing trust and thus vulnerability and risk in the system. Bank note (bearer promissory instrument) issued by the North of Scotland Bank, 1945. 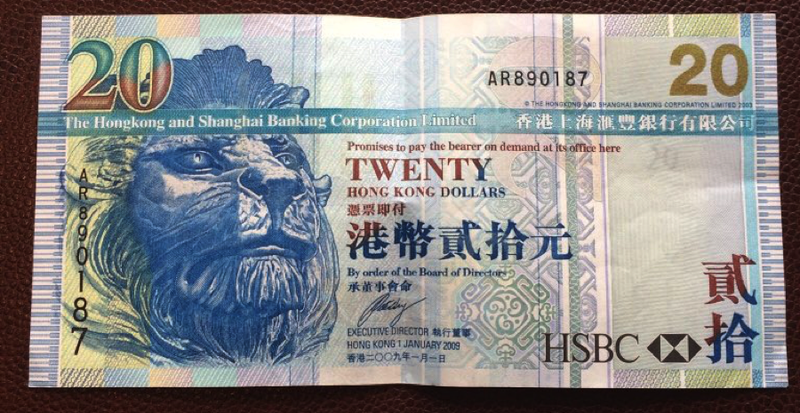 Many banks besides central banks have issued bank notes that circulated as currency. George Selgin and Lawrence White among others have done extensive work in this area. Knowledge of the long history of non-governmental money was one of the inspirations of the original invention of trust-minimized cryptocurrency. This practice continues to this day in Hong Kong and Scotland. Stockholms Enskilda Bank note, Sweden, 1876. Critics have said that decentralized note issue, following the same principles of fractional reserve and maturity mismatch as central banks, were just as or more prone to runs on the bank. Defenders have argued that competition between note-issuing banks formed a peer-to-peer system where banks could redeem competitors' notes, making it more reliable and robust form of fractional reserve banking than a central bank run or managed fractional reserve. Hong Kong & Shanghai Banking Corporation (HSBC) bank note, 2009. Ipswich Bank, a "country" (non-London) bank in England, 1820s (this instance unissued). Traditionally country banks, like the Bank of England, redeemed for specie, i.e. the official coin, which contained a standard weight of monetary metal (usually in this era silver). 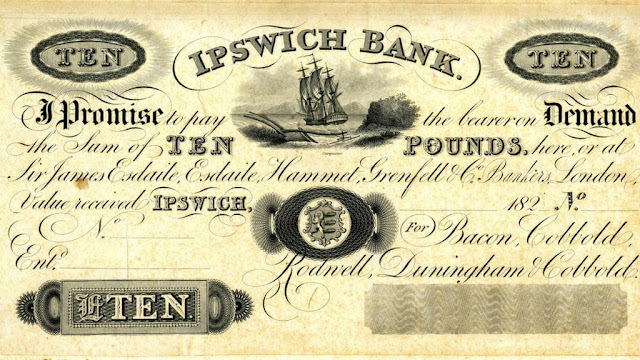 After 1833, Bank of England notes became legal tender which holders of country bank notes had to accept in lieu of specie. Mechanic’s Bank note of 1856, Augusta, Georgia. Before our Civil War, most paper money in the United States was privately issued. Bank of De Soto note, De Soto, Nebraska, 1863. Critics have called this era of U.S. private bank note issue the "wildcat banking" era. Collectors sometimes call surviving private bank notes "broken bank notes", because notes from banks that were quickly or never redeemed are much more likely to have survived in reasonable to excellent condition. Hagerstown Bank note, Hagerstown, Missouri, 1850s (this instance unissued). Some other scholars within the Federal Reserve remembered the private note-issuing era in the United States; their central bankers' view of it can be found here. 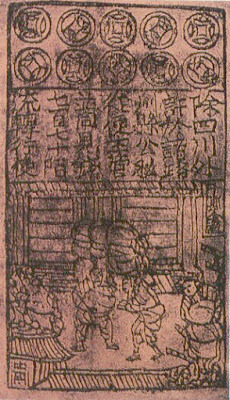 Jiaozi, a bearer promissory note from the Song Dynasty. 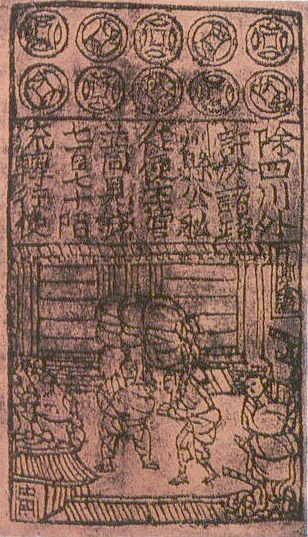 The earliest jiaozi were issued in Sichuan province by merchants to relieve their fellow merchants of the high costs of transporting the heavy government-issued iron coins. 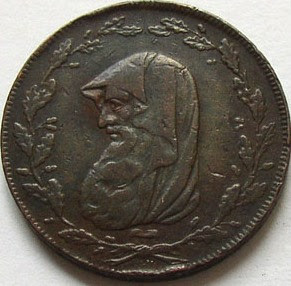 Anglesey & Mines druid half-penny, England, 1788. 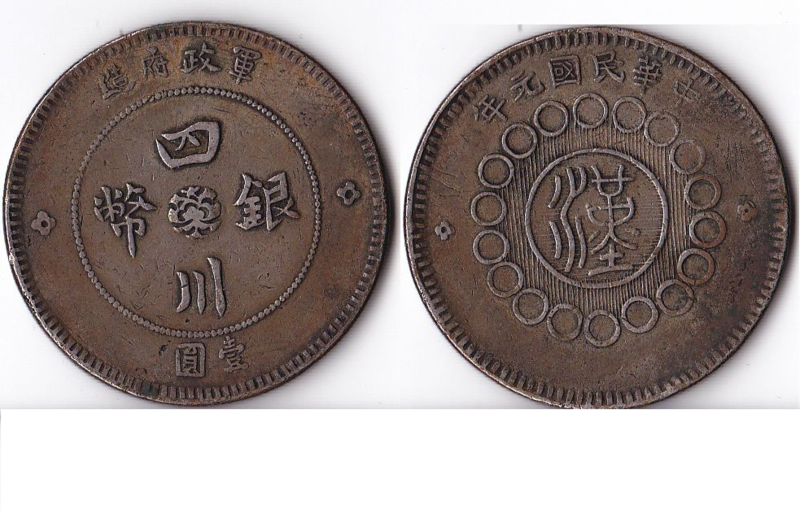 "From 1787 to 1797, private merchants and industrialists issued 600 tons of custom-made 'commercial' copper coin, which was more copper coin than the Royal Mint had supplied during the previous half century." [Source]. 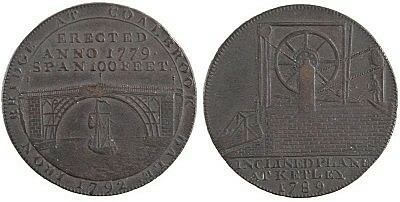 Ironbridge coin, minted by Coalbrookdale Works, Shropshire, England, 1782. In the industrial revolution, factories had to attract workers with frequent pay that could be spent at bargain shops. The Royal Mint was not producing low-denomination coins, so factories minted their own or used the coins minted by another firm. A good review by Jeffrey Hummel of George Selgin's excellent analysis of this era here. Privately minted coins from Sichuan province, China, 1912. While the minting of private coins, especially imitations of official coins, was often banned in order to secure a royal or other political monopoly, the industrial revolution was not the only time or place where private entities minted. Private coinage was by no means even limited to the Anglosphere. Nevertheless, the vast majority of coins in the numismatic record were minted by or under the license of kings, emperors, elected officials, and other kinds of political leaders, and these are also the kinds of coins prized by political historians as the most durable records of a leaders' reign. In part (ii) of this series we will explain and give a few examples of the monetary metals themselves, usually mined and processed by private entities. For most of monetary history, from ancient civilization until recent times, the monetary metals were the ultimate "O" in the IOUs -- the substances that bearer promissory notes were most often redeemed for -- and constituted the most common contents of the coins themselves. The various forms into which monetary metals could be shaped, including coins, were sampled and assayed for their metal content when used outside of the locale where they were issued or covered by legal tender laws. Part (ii) will also explain why these metals, not any of their particular forms, are the closest analog we have to Bitcoin in monetary history. Finally, we will cover some the many other forms besides coins that these metals could take, the monetary and quasi-monetary functions of these forms, and get some glimpses of even more ancient forms that were the common ancestors of modern money and modern jewelry. Part 2 can only scratch the surface of this vast topic and will refer the reader to more in-depth works including those of this author. In order to close the theoretic gap between fiat money and private money, a generalized notion of demurrage is critical. The government (supposedly) protects property rights, just as does a precious metals bank protect its deposits from theft -- deposits that back its bearer certificates. In both cases it costs to secure the property. The way this cost gets billed is where things seem to go awry*. Fiat money decouples issuance (source) and taxes (sink) from the liquid value of the property rights the government is supposedly protecting. Banks loan out their deposits at interest to pay the protection costs. Put both of these shenanigans together and you have the Federal Reserve. All of the Fed's noise about adjusting the "money supply" in response to "the demand for liquidity" elides the question: What is the fundamental source of demand for liquidity? The answer is in the risk-adjusted net present value formula which relates static to dynamic value: The liquid value of a property right is calculated from the risk-adjusted net present value of its profit stream. *Cryptocurrency's equivalent of demurrage is the cost of securing the blockchain. An excellent historical perspective. Many people believe (because of the name Federal) that the Federal Reserve is part of the government. In a strict sense the ‘notes’ issued by the Federal Reserve are along the same lines as the private notes issued by the ‘banks’ i.e. private parties listed above. No more or less “valid” other than they own a monopoly on the right to lend money to the US Treasury department. Fascinating, Nick, thank you so much for posting this. Can't wait for part is! You might want to talk about the frequent bankruptcies from private issuers of IOUs. The problem is fractional reserving, and inadequate reserves for losses if an entity lends against uncertain collateral. Think of a pawn shop or a money market fund, and you might get to the right model. Very useful thank you. Are you going to say anything about tally sticks? I'm trying to work out if they were a type of transaction recording mechanism that embodied trust in the design. Excellent. Looking forward to reading Selgin's "Good Money"! "The closest historical analog to the Bitcoin settlement layer is not to the bank notes, nor even to the coins (despite its name), it is to the monetary metal"
"One of the more common modern legal definitions of “money”, used for laws that facilitate and support financial interchange...is that money can only be an official government currency"
Bitcoin's being finite yet the central financial medium between blockchain and fiat, does this not mean that the "perfect" finite product is being converted into an infinite fiat supply for every day use? This takes away from actual settlement into "metal money". Unless the total metal money supply was recorded from first block. In a perfect world, that physical/fiat/infinitely printable money would come back into the blockchain. But governments are trying to ensure that fiat only goes into the blockchain for their ownership (centralizing) of it to the fullest possible degree. Would be honor to share my thoughts with you. Preparing a dissertation on this and more, much inspired by your past works. My hypothesis is seemingly in direct opposition of your part II. Hoping to hear criticisms on my theories. Do you want to see your website or blog on Google's first page ??? And want to beat your website or blog ranking ?? Your website and blog will be displayed on the first page of Google through the SEO service, completely and beautifully. And get more visitors. Click this for more details : "SEO services provider"